The Cienega Watershed — located southeast of Tucson, Arizona — is the basin bounded by the Whetstone Mountains to the east, the Santa Rita Mountains to the west, the Canelo Hills to the south, and the Rincon Mountains to the north. 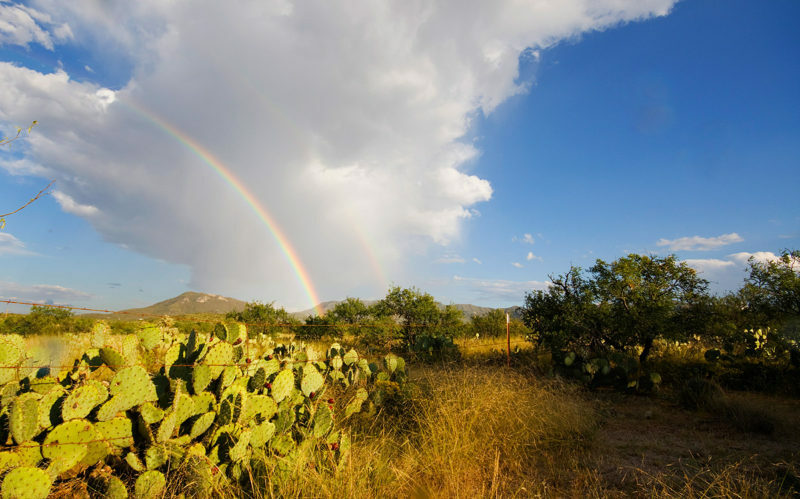 The upper elevations of the watershed include oak and ponderosa pine forests while lower elevations are comprised of magnificent saguaros, desert scrub, rolling grasslands, oak-studded hills, and the lush riparian corridor along Cienega Creek. Water drains from these mountains toward the Cienega Creek Valley. Boundaries of the Cienega Watershed. Click image to view or download in PDF format. Map courtesy Pima County Regional Flood Control District. 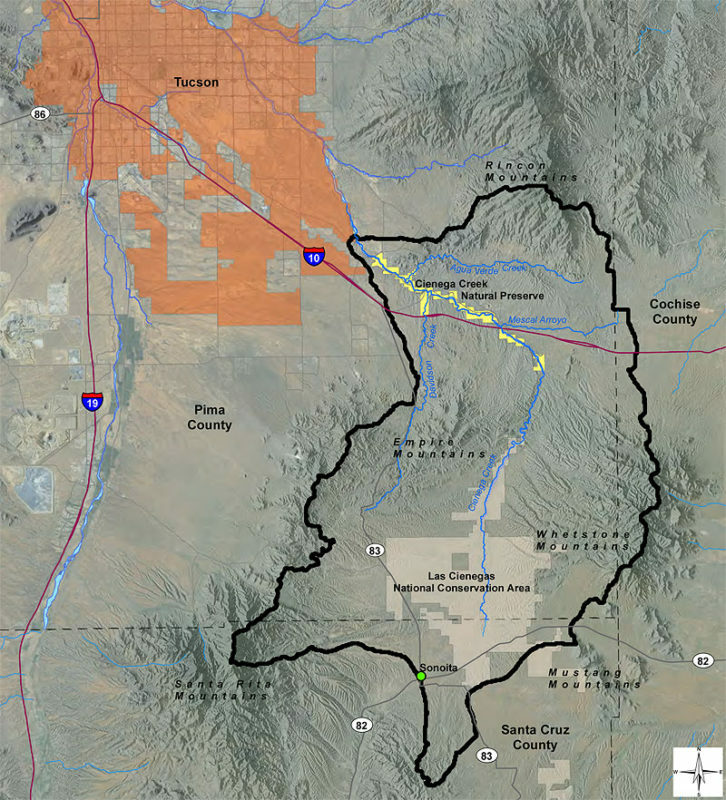 The watershed forms a vital wildlife corridor connecting the diverse ecosystems of the Sonoran and Chihuahuan deserts and grasslands with the Sierra Madrean and Rocky Mountain forests and woodlands. Cienega Creek is one of the few remaining perennial streams in Arizona, providing critical habitat especially for threatened and endangered species. Click photos to view in larger size. Photos by Dennis Caldwell. The Cienega Watershed contains important heritage sites. It has been home to diverse groups since at least 9,000 BCE and perhaps longer. Native groups successfully adapted to the changing environment for thousands of years, becoming agriculturalists eventually. In historic times, Spanish and then Anglo ranchers and miners used the landscape. The Empire Ranch and Kentucky Camp are examples of historic to modern ranch and mining sites. The Cienega Watershed is predominately federal (Bureau of Land Management and Coronado National Forest) and state trust lands with private lands scattered throughout. The Las Cienegas National Conservation Area (managed by the Bureau of Land Management) was designated by Congress in 2000. Sonoita, Vail, and Elgin are important communities in the watershed. As a result of agency and community efforts, the Cienega Watershed has a history of strong public engagement, land-use planning, adaptive management approaches, and strong partnerships including the Cienega Watershed Partnership. Such engagement includes a variety of annual workshops and on-the-ground projects to improve and conserve the landscape. Continue to explore the Watershed to learn more, or contact us.